Welcome to the second edition of the Rundown Report. If you missed our first issue you can check it out on our blog. We’ve been searching the web for the latest news from around the world of online marketing and social media and have collated some of the most interesting articles below. Make sure you check out the Rundown Report every Friday to keep up-to-date with the online marketing and social media scene. Stats to shape your next email marketing campaign | Need some help putting your next email campaign together? Luckily, Boomerang have put together this fantastic list of pointers and stats to help you out. The most overlooked email marketing strategy: segmentation | Marketing Land have taken a detailed look how segmentation can really help boost your email marketing campaign engagement. How to create SEO-friendly email campaigns | There’s a huge focus on SEO-friendly content across the web these days. Check out this informative article from ClickZ on how to write SEO-friendly text for your email campaigns. 5 tips to master Pinterest for business | As a social network on the up, Pinterest offers a great platform for business. Thankfully, Entrepreneur have made grasping this social network a lot easier in this recent blog post. LEGO builds a solid social marketing strategy to promote new movie | At Sign-Up.to we love LEGO, we love movies, and we especially love social media. This appeals to us on so many levels, but we think you’ll find it interesting as well. Thanks Econsultancy. Twitter shares priced at $26 each | This week saw the stock market floatation of Twitter. BBC take a look their share valuation and what this means for Twitter users. The Verge were quick to report a share price increase to over $45 as soon as the markets opened. Holy shmoly. Marketing automation: six case studies and an infographic on how it improves sales and revenue | It’s a topic close to our hearts. Take a look at these fantastic case studies from Econsultancy on why you should use marketing automation in all aspects of your business. John Lewis’ epic journey: the evolution of its Christmas campaigns from 2007 to 2013 | We all love a good John Lewis Christmas ad. Marketing Magazine look at the evolution from their 2007 ad to now. Are we a bit early for this? 7 marketing truths every business leader should know | It’s important to be realistic with your marketing efforts. Entrepreneur have collected these seven truths which should help with your marketing. Distance to Mars | As if last weeks boredom-buster wasn’t interesting enough, take a look at this wicked pixel representation of how far we are from Mars (and our moon). Mind. Blown. 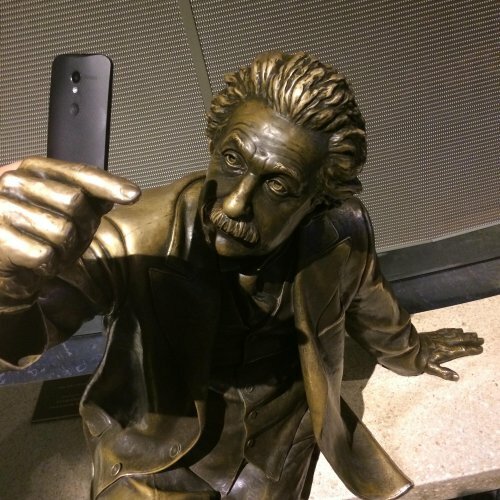 Einstein taking a selfie. This has gone too far. Is ‘statue selfies’ going to be the next social media craze? I predict not.